Sarah Nader - snader@shawmedia.com Jake Rugg, 6, of Island Lake plays table tennis during Healthy Kids Day at The Sage YMCA in Crystal Lake on Saturday, April 28, 2012. Sarah Nader - snader@shawmedia.com Ellie Landoch, 7, of Cary stretches out while participating in a kids yoga class during Healthy Kids Day at The Sage YMCA in Crystal Lake on Saturday, April 28, 2012. The event was geared towards creating a healthy lifestyle and featured games, dance and XBox kinect contests, family Zumba, Healthy Kid seminars with local health experts and healthy snacks. 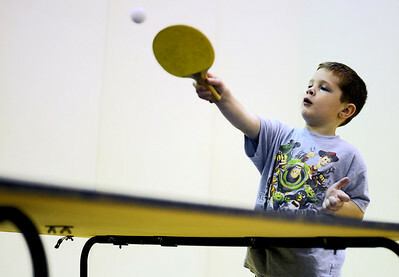 Jake Rugg, 6, of Island Lake plays table tennis during Healthy Kids Day at The Sage YMCA in Crystal Lake on Saturday, April 28, 2012.